Are you looking to cut through all the noise and find out what ObamaCare really is, what it does, and, most importantly, what it means to you? No one can escape the public debate around The Affordable Care Act, otherwise known as ObamaCare. The law significantly impacts modern health insurance, but, while most media outlets offer up strong opinions about the politics surrounding the act, most tell you next to nothing about what it actually does and even less about how it affects you. Can ObamaCare save you money? Can it help you get better health insurance? 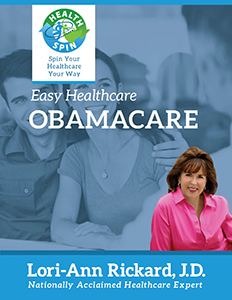 A healthcare lawyer for over 30 years, Lori-Ann Rickard can give you the no-nonsense facts about ObamaCare with her latest MyHealthSpin expert’s guide to this complex issue!